DVDFab DVD Copy is a powerful DVD to DVD copy software. 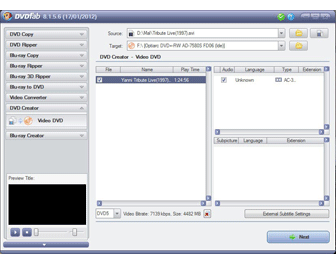 With 8 DVD copy modes, you can burn any DVD to DVD disc or copy it to your hard drive, easy and quick. iConvert is a smart and simple video converter for iPhone, iPod, iPod Touch and iPad. It is capable of converting any video file format, to optimized videos that you sync with iTunes to your own Apple iDevice. AVS Video Converter is a complete video software solution for video and DVD conversion, DVD burning, video editing; join, trim and split - supports all key formats and HD video. DVDFab Blu-ray to DVD Converter is an all-in-one tool for conversion of Blu-ray movies to DVD compliant format. You insert the BD disc, and DVDFab will rip, convert, and burn it to DVD - easy and quick.